What a surprising weather day today with a foreboding forecast of rain all afternoon, but the joy of sunshine with 68 degrees was what we actually got. We decided to venture out again into new territory for us and became flâneurs or strollers through the 18th arrondissment. For those who may not know, Paris is arranged in circular fashion like a snail into 20 areas or arrondissments, starting with “the 1st” in the center and working outward to the suburbs. Honestly, in twelve years’ time, we haven’t done a very good job of learning much about the outer areas. 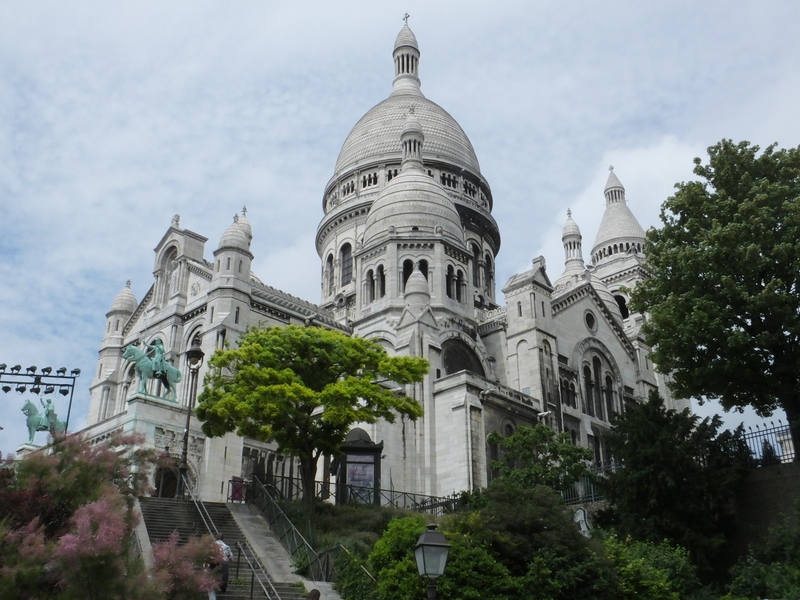 Today, we chose “the 18th” with Montmartre being the center attraction. Of course, we know that area well, but there is so much more to see as we discovered today. We took the Métro to Barbès Rochechouart and suddenly found ourselves in a slightly different, but very interesting, world. I had read terrible things online about being attacked by the “cigarette guys” and physically manhandled by people on the street, etc. etc. Of course, NONE of that was the case. Yes, it was a very ethnic area, working class, many Algerians, and maybe like going to Harlem in New York City. There was a spice and vitality to the shops, some of which were tiny holes in the wall, selling all kinds of merchandise at greatly reduced prices. As soon as we came out of the subway, we saw the rather famous, large discount department store called TATI which boasts the lowest prices in Paris. A quick run-through made us think of a very large BIG LOTS but with lower prices. 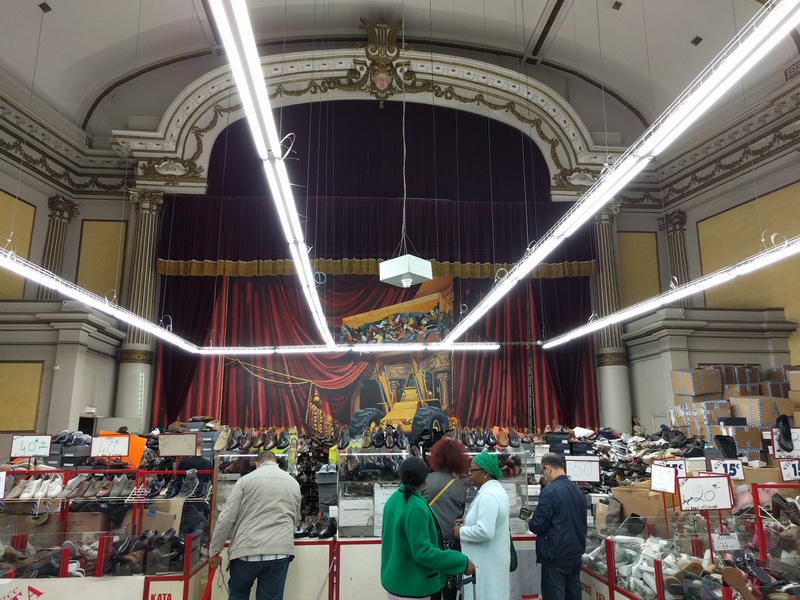 One of the shops selling discount shoes had once been a lovely theatre. Interesting but sad. 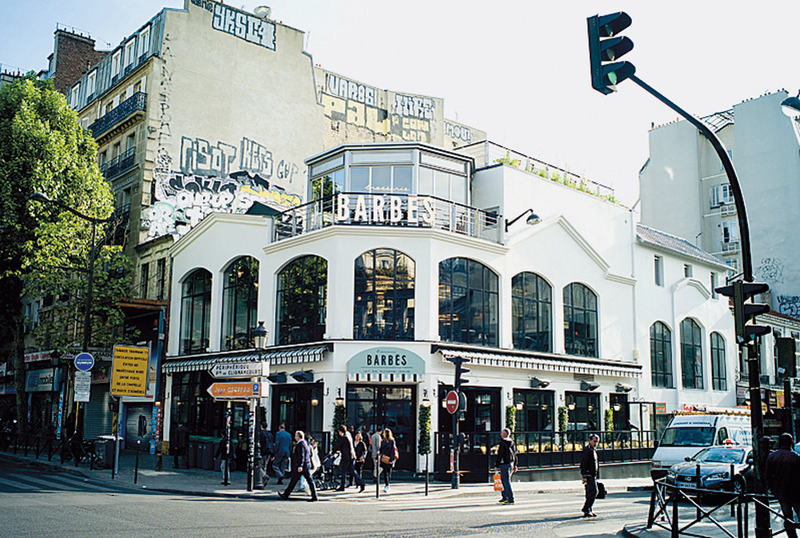 On the opposite corner from TATI was our choice for lunch, Brasserise Barbès. The reviews were quite good, and we were not disappointed. We had one of the best lunches we’ve had so far. Bernie got the Thursday special which was half a chicken with frites, and I had a vegetable risotto. Both were excellent with large portions, especially for Paris. Here’s a photo of the upstairs area where we were and the exterior from their website. It is huge with three stories. We were inside but with fresh air coming in from the sides of the sky light. After a long stroll up Boulevard Barbès, we found the street we were looking for, rue Muller. 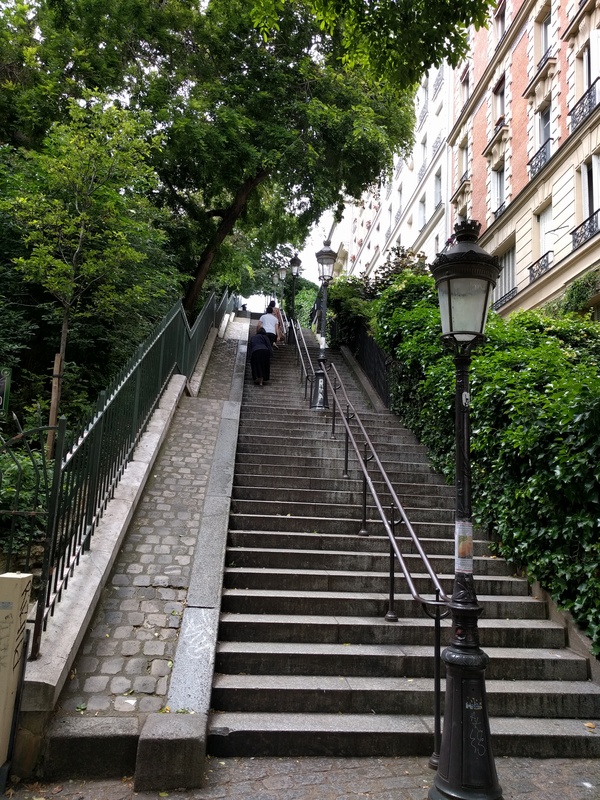 Up, up, up the mountain we started toward Montmartre until we came to the little café called L’Ete en Pente Douce which has great ratings on Trip Advisor and all kinds of award stickers on the facade–always a good sign in Paris. 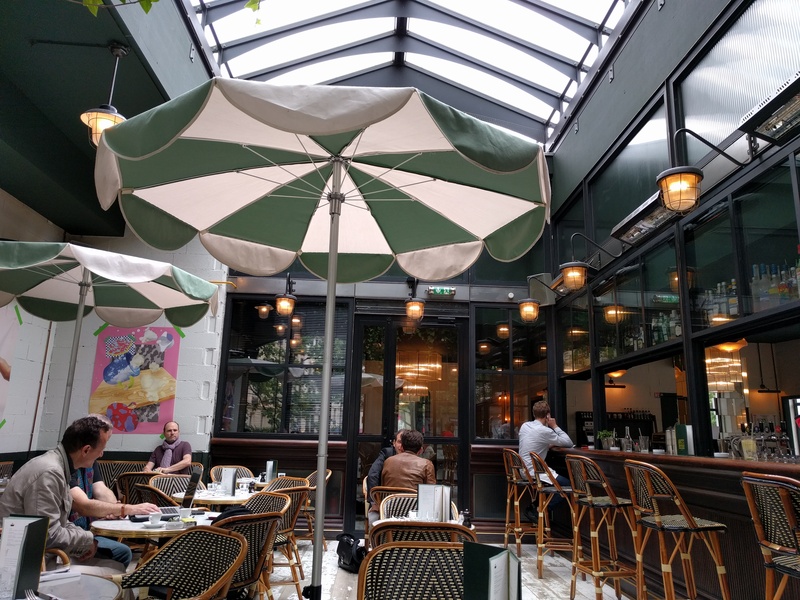 It translates something like “Summer on a Soft Slope.” We were stuffed from lunch so didn’t sample anything to eat, but we will definitely try it for lunch on the next trip up to Montmartre. All the outside tables were covered with artwork. We didn’t really intend to go up to Montmartre but couldn’t resist since we were so close, and it was such nice weather. So after 300 steps, we made it to the top and caught some fun pictures of a bride-and- groom-to-be. 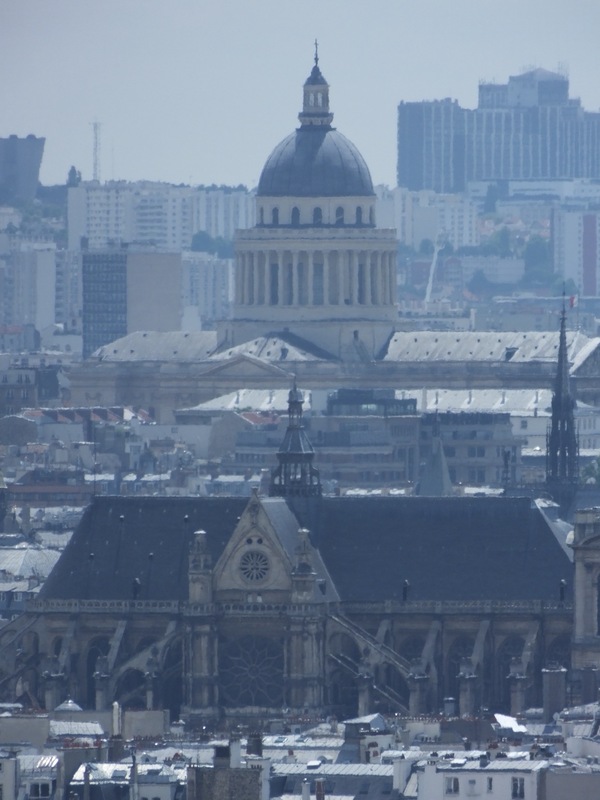 On top, Bernie could not resist Le Sacre Cœur and with very little haze today was able to see Les Invalides. 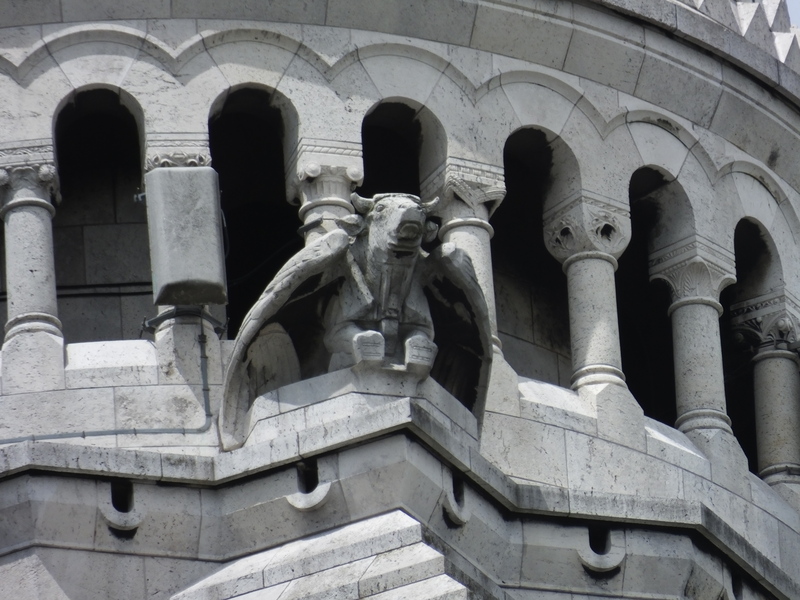 Look closely at the church right in front of the gold doom as it is the Basilica from yesterday’s blog post with the flying buttresses! It was a perfect day for us and we hope you enjoy becoming a Flâneur along with us. I love traveling with you both. You do the walking, pictures and travelogue and I get to enjoy! So glad you are enjoying. Is the heat any better? 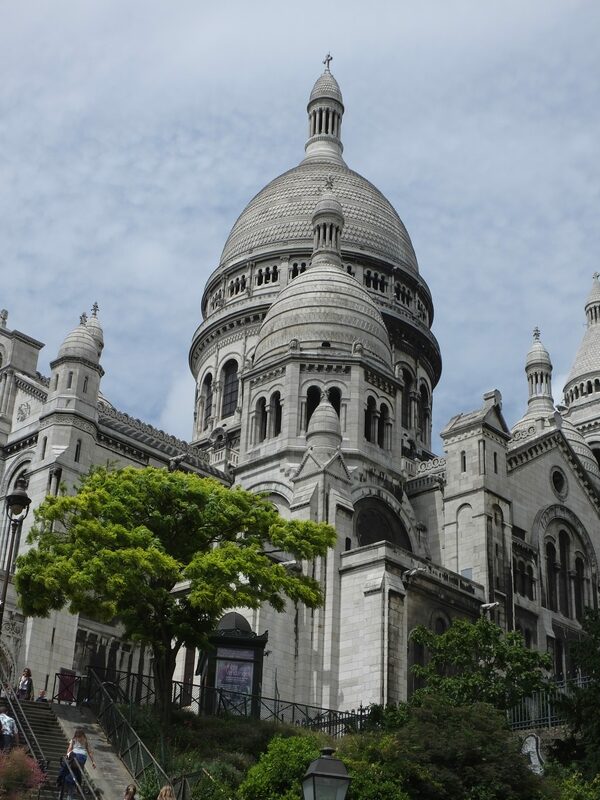 What a lovely day for a stroll around Montmartre! All those steps earn you an extra dessert! We leave a week from today. Yikes! First to Atlanta to catch our flight, then several days in Germany before Paris. À bientôt! Have you been to this area, especially TATI? Oh, today’s blog is one of my favorite so far! 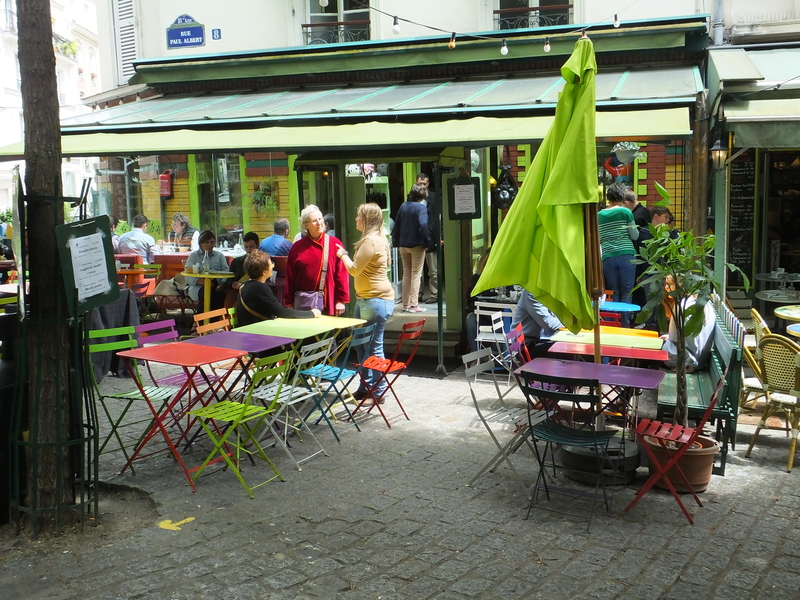 I enjoyed the traditional sites of Paris mixed with new eclectic sites. 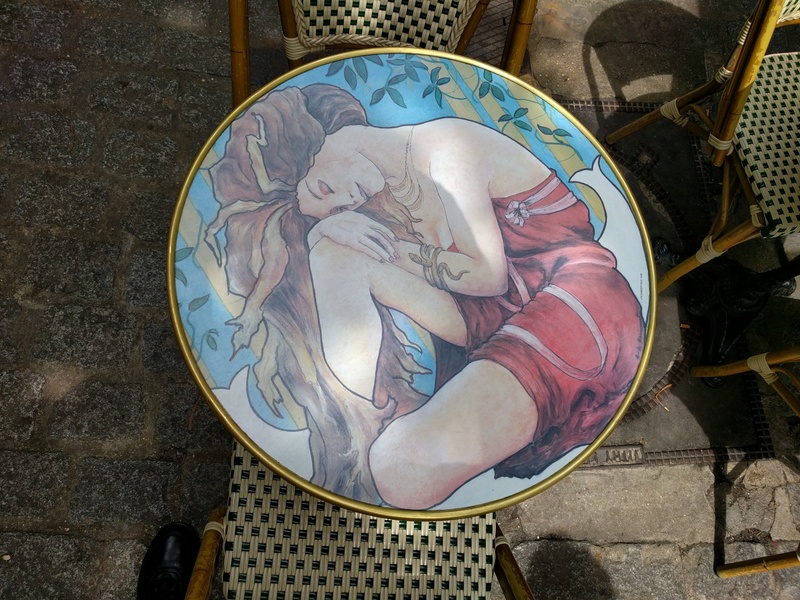 I love the tables with art work. You have been so supportive. Merci! 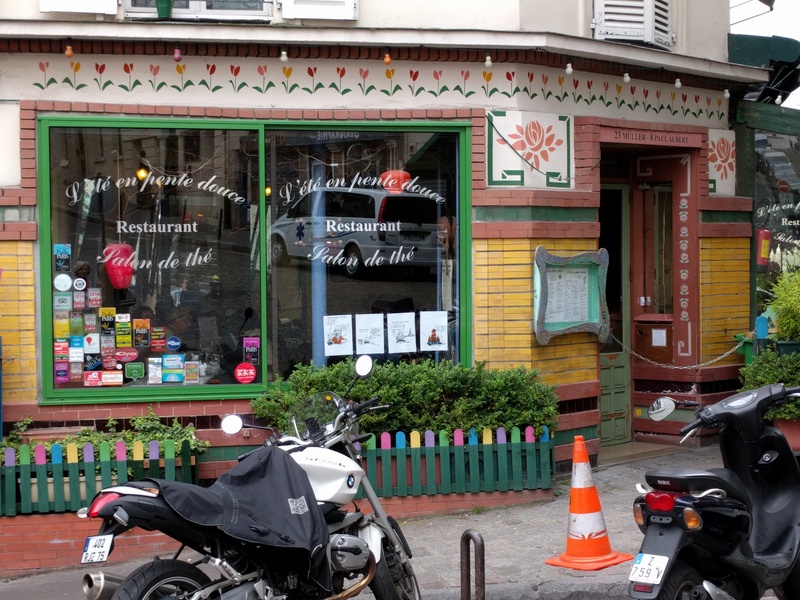 If you haven’t tried “Le Coq Rico” in Montmartre, give it a try for lunch. One of our favorites. Especially fun to sit at the bar and talk to the chefs! No, we haven’t eaten there! Thanks for the suggestion. Is it right on top or where? 98 rue lepic. You can see it on TripAdvisor and on Google. We. First came across it while following Rick Steve’s walking tour. Hope you find it!